To the time We are Understand Google Adsense is one and Only advertising Company who are Pay properly and time to time. So we are all Trust her but Some Bloggers are Earn money to another source like Affiliate Marketing, Guest Posting Etc. But New bloggers are earning money only Adsense at initial stages. First Google Adsense are approving Your Site Then Place their code our sites and Show the ads Then Earn money. So Firstly Need to Approval This causes Some condition are needed. When You first time You create a blog. Then Four Pages are Mandatory. These pages are Mandatory Otherwise google are not approve your sites. So, Guys, We are Discuss This Articles, How to create Privacy & Policy, Contact us Pages for free.. Contact us Pages are the most important part of Your Blogs. It's just Authors/ blog owners identity. Which MOTO in these blogs. Write Your Blogging Moto/mission or tell about your introduction, Why you start blogging etc. Other Wise You Don't know in English. You can Create Your About us page in Online About us Generator. We Know Properly Privacy & Policy page Creates are So harder. 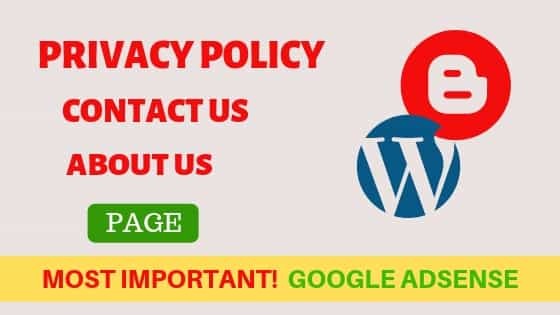 So We will decideOne Alternating Way we are Discuss in this article, You Will Create Professional PRIVACY & POLICY and DESCLAIMER pages for free. You can Choose Pro plan, they are more Customisable but Free plan are So effective. Create a Simple Blog Pages and Don't Publish. Then Click the HTML Section. Open Google Forms and Sign in Your Existing Gmail ID. Create a Simple Forms. BLANK >> Click Here >> Open a New Blank Page . Now You can Customise Your own Contact forms as You Want and Make sure Edit your Page Resolution size. Now Click on >> SEND . Then Copy Your Google Forms Code and Paste Your Blog's HTML Section. Now >> PUBLISHED. Then Publish and You can Create beautiful Contact us Page on Blogger for free. Edit Your Then Paste This Code on Your HTML Section on Your Page and Done! Type CTRL + F and Type Yoursite.com and Replace Your Site URL.Then You Create Successfully SITEMAP page. Hopefully Helpful in This Article and Rate Us .